Translation company Lexcelera connects the best human talents with trusted technology to help you reach your global markets faster and more efficiently. Today, Lexcelera’s advance in MT engines extends to the newest game-changing technology: Neural Machine Translation. This approach, based on artificial intelligence, is generating the highest quality automatic translations. 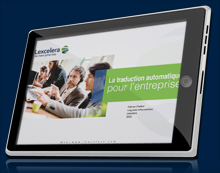 To give its largest customers greater visibility on projects, Lexcelera has created a customer translation portal. This portal provides real-time access to individualized dashboards and simplify the process of launching projects. The LexTranslator widget is a customized, on-demand machine translation solution. It is available in up to 50 languages for all types of online content including websites, e-Commerce shops, online help, chat and community forums. Translation Memory “recycles” text by saving it in memory, resulting in significant savings – not to mention gains in speed, efficiency and consistency. Costs continue to decrease over time as more translations enrich the memories. Multilingual SEO – or Multilingual Search Engine Optimization – is critical for optimizing your online keyword strategy for driving global users to your website. Multilingual SEO is more effective than a direct translation. Social media today is helping companies meet their marketing goals, whether it’s a Twitter feed that drives customers to a website or a blog post that helps convert prospects to leads to satisfied customers. Our language tools consulting service helps companies identify where their translation and localization processes can be optimized. We help our customers meet their goals such as to reach international markets more quickly.